› Author Affiliations Funding Dr. Fiks is a coinventor of the “Care Assistant” software that was evaluated in this study. He holds no patent on the software and has earned no money from this invention. No licensing agreement exists. Dr. Fiks has also received an Independent Research Grant from Pfizer from which he personally drew no support. Dr. Grundmeier is a coinventor of the “Care Assistant” software that was evaluated in this study. He holds no patent on the software and has earned no money from this invention. No licensing agreement exists. Mr. Miller is a coinventor of “Project SHARE” which is a Care Assistant module to support the care of children with attention deficit disorder. He holds no patent on the software and has earned no money from this invention. No licensing agreement exists. The other authors have indicated they have no financial relationships relevant to this article to disclose. Background With the widespread adoption of vendor-supplied electronic health record (EHR) systems, clinical decision support (CDS) customization efforts beyond those anticipated by the vendor may require the use of technologies external to the EHR such as web services. Pursuing such customizations, however, is not without risk. Validating the expected behavior of a customized CDS system in the high-volume, complex environment of the live EHR is a challenging problem. 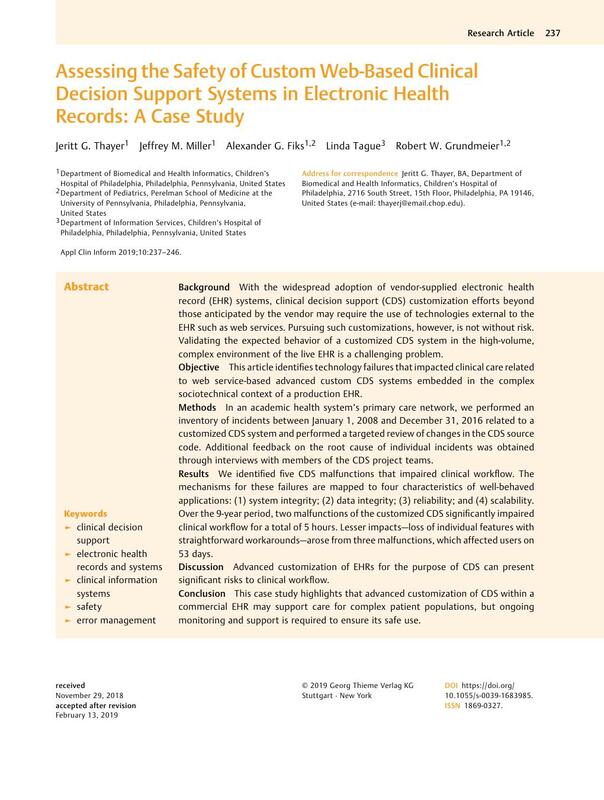 Objective This article identifies technology failures that impacted clinical care related to web service-based advanced custom CDS systems embedded in the complex sociotechnical context of a production EHR. Methods In an academic health system’s primary care network, we performed an inventory of incidents between January 1, 2008 and December 31, 2016 related to a customized CDS system and performed a targeted review of changes in the CDS source code. Additional feedback on the root cause of individual incidents was obtained through interviews with members of the CDS project teams. Results We identified five CDS malfunctions that impaired clinical workflow. The mechanisms for these failures are mapped to four characteristics of well-behaved applications: (1) system integrity; (2) data integrity; (3) reliability; and (4) scalability. Over the 9-year period, two malfunctions of the customized CDS significantly impaired clinical workflow for a total of 5 hours. Lesser impacts—loss of individual features with straightforward workarounds—arose from three malfunctions, which affected users on 53 days. Discussion Advanced customization of EHRs for the purpose of CDS can present significant risks to clinical workflow. Conclusion This case study highlights that advanced customization of CDS within a commercial EHR may support care for complex patient populations, but ongoing monitoring and support is required to ensure its safe use. This study did not involve human or animal subjects research.